Modern market is a thing full of twists and turns at every corner that requires flexibility and ability to adapt to the ever-changing state of things. “Agility” is the word that best describes what it takes to be competitive in the modern world. You simply won't get anywhere if you aren't ready to adjust according to the situation and bend it to your benefit. It is true for most industries, but especially so in software development. Cue DevOps. If you are thinking about developing a web or mobile product, agility is the means to tangible results: speed of the work process, implementation of the new features, team efficiency, optimization of the product and so on. Basically, being agile becomes a strategic advantage for a company and the product both in the short run and in the long run. It is even more apparent when it comes to an outsourcing segment where everything lives and dies on how they are able to adapt and go beyond. DevOps approach implementation is one of the means to be more flexible and adaptable thus more competitive. But let's begin with definitions. DevOps is a cross-functional approach to the process. DevOps model is a combination of two distinct part of the software development process - development and operations (AKA infrastructure management). Basically, it is a result of streamlining the organization in order to make it more flexible, dynamic and ultimately effective. This streamlining was necessitated due to ever-growing, sprawling organizations that take too many resources and hold down overall flexibility of the development team. As such, DevOps is more of a mindset than anything else. It is about tight collaboration, being on the same page and delivering to the common goal — improving every element of the product and acting as fast as possible to the emerging situations and morphing requirements. In other words, let’s quote Daft Punk: “Work it, make it, do it. Make it harder, better, faster, stronger”. That’s what DevOps is about. Two words — mobility and flexibility. Customer feedback and testing is a big deal when it comes to making a good product that will outlast the initial splash. Because of that, it makes sense to adapt according to order to keep the product adequate and capable of doing its work. However, it is not exactly the easiest thing to pull off due to long iteration cycles and scaling large team to the cause. The main task of a DevOps engineer or specialist: make sure the software works both from the developers' standpoint as well as infrastructure standpoint. When you implement a DevOps culture, it enables to implement changes effectively and on time. The result — overall better product that does better business. The biggest benefit of DevOps from a business point of view is obvious — it is all about the speed of delivery. Due to significant streamlining and reorganization of the workflow — the very process transforms into more dynamic and efficient. That, in turn, makes iteration shorter and much more responsive while avoiding the danger of breaking the things while moving too fast. Basically, it means faster moving in shorter steps i.e Continuous Integration and Continuous Delivery (aka CI/CD). As such, it allows to gradually implement small changes that contribute to the whole. In addition - shorter iterations mean that even if there are some fails - their scope will be much smaller and that means it would easier to deal with them. The nightmarish notion that everything will break down at once is practically non-existent with this approach. Scalability is one of the top priorities for any kind of the project. If the product is able to take a load and get on with it — it is a sign that it works well. If not — you know what it means. With the rise of cloud computing, it became a big deal. DevOps implements certain practices to secure better scalability. In essence, scalability is not just what server and network are able to carry on — it is also the tools that make it happen. It is important to configure the system in a flexible manner so that when necessary it will be able to increase the resource consumption and also scale it down when the load is lesser. The thing with these tools is that they need continuous optimization — changes in server, bandwidth and storage capacity. One of the most obvious benefits of implement DevOps principles is a significant streamlining of the communications. It is always a good thing when everybody is on the same page and every member of the team is able to contribute to the process. Since collaboration and communication are in the center of the DevOps approach — implementation of it manages to set a much more creative environment that can positively affect the quality of the product. For instance, streamlined communication eases getting the team on the same page. It also helps with onboarding new members of the team. It is also helpful in describing priorities of the current moment. DevOps automates certain routine elements of the development process and allows developers to focus on other more demanding and important elements. As a direct result of tighter communication — team scalability makes a significant leap forward. Most of the time, people need some time to get acquainted with the project. When the DevOps approach is implemented right, it shortens the time people need for adjustment because everything works as a well-oiled machine. Because of that, you don't have to worry about the fact that you face the need to scale your team and it might break the workflow. DevOps makes this process much more efficient and easier. Read more about DevOps Team Structure. The development process is riddled with repetitive routine tasks that just need to be done. It takes time and greatly affects the motivation of those who are tasked with such things. While important, these routines often take a precious time that could’ve been used for something more important. DevOps makes it almost a non-issue with the help of automation. Not only it creates a more efficient workflow but it also helps with keeping everything monitored and reported. It is especially important for testers who can't afford to miss something in the sea of code. The decrease of manual actions leads to much more time to dedicate to more important things. Writing a coherent project documentation is something that some businesses neglect, but at the APP Solutions, we put stress this part of the project's lifecycle. But no matter how good your initial technical specification is, it is often an evolving entity, especially for bigger and more complex projects. No matter how hard you will try to describe everything to a tee — things change when they get done and that should be reflected in the technical documentation. Otherwise, nothing will make sense and ultimately everything might fall apart. Because of that, there is a lot of backtracking and adjusting the code and documentation to one another. How can the DevOps approach and specialists help? Due to the transparent and highly organized structure of the code — there is lesser dependence on the documentation. Everything can be understood through the code itself. Which makes tech documentation more of a solidification of the fact that a herald of things to come. The other big advantage of a DevOps approach is a significant clarification of the code infrastructure. How DevOps makes the save? DevOps enables unification of the code: it cleans the code up, makes it more transparent and easier to operate with. It also solves any emerging issue connected with the legacy elements. Infrastructure is what ties together numerous elements of operation — networks, virtual machines, load balancers and so on into a comprehensive mechanism that ticks like a clockwork. Project's infrastructure, like the tech specification, evolves with the product and often gets muddied up over time if no specific measures are taken to prevent this. As a result, this might seriously affect the quality of performance and effectiveness of the operation. This is the case not only for cloud storage but also for dedicated infrastructure. However, manual configuring of an infrastructure is time and resource consuming. DevOps makes it a non-issue by switching from manual interaction to programmatic and implementing several methodologies, such as continuous integration and version control. This drastically decreases the possibility of getting funny bad things in the system and eliminates the element of unpredictability. Programmatic interaction with the infrastructure is standardized and streamlined to the essentials — there is a set of patterns the system follows. It enables testing as soon as possible which enables adjustments and fixes early on. Another important element of Infrastructure as Code approach is Code Review. This gives clarity of the situation and provides a perspective for the team over the infrastructure changes. This is important in keeping everybody on the same page perfectly synchronized. Last, but far from least benefit that comes from transparency and the organized code is a vast simplification of implementing security measures. Usually, security is the hardest element to pull off as it is always somewhat detached from the main system. This process starts from assets inventory and goes all the way through access inventory to the implementation of security measures such as system scans. However, with the structure crispy clean accessible and the majority of the processes automated — it is not a big deal to keep the thing safe. 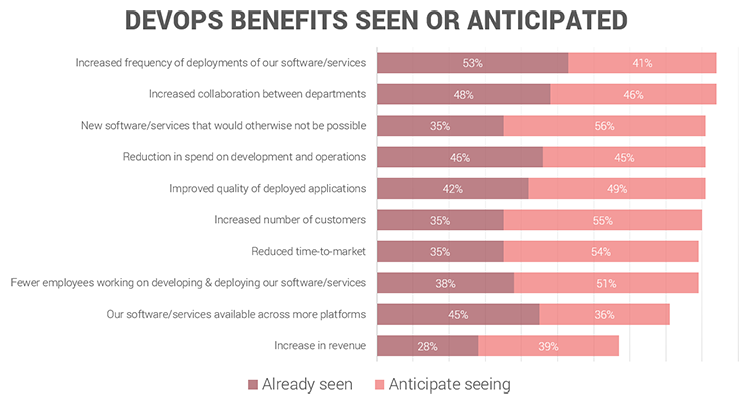 According to the statistics, it is clear that DevOps has lived up to all the expectations the developers had. The only thing that hasn’t quite hit the mark is the increase in income but this is expected to change. DevOps is one of the most exciting practices of the current moment. It is slowly but surely spreading its influence over the software development industry and establish itself as a standard operation. It is a good thing because order and clarity are amongst the things every project is striving for. That is why DevOps methodology matters and why you should implement its practices in your project. Are you looking for a software development provider?